Trivia: The band Gnarls Barkley sampled the soundtrack from this film for their hit song "Crazy". 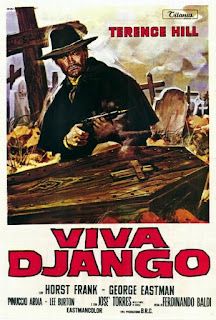 Sergio Corbucci’s 1966 western Django was a box-office sensation, and for years afterwards a slew of films tried to capitalize on its success by putting “Django” in their title. Most (including Quentin Tarantino’s excellent 2012 film Django Unchained) had no connection whatsoever to the original movie. One notable exception is 1968’s Django, Prepare a Coffin, a prequel of sorts to Django that was co-written by Franco Rossetti (who also penned the original). Unfortunately, Franco Nero wasn’t available at the time (he was busy making Camelot in America), so the lead was played by Terence Hill, a charismatic actor who would shoot to superstardom a few years later as the title character in 1970’s They Call Me Trinity. This, plus the return of cinematographer Enzo Barboni (who did a masterful job shooting Django), was enough to ensure that Django, Prepare a Coffin would, at the very least, be a solid follow-up to Corbucci’s 1966 classic. While guarding a shipment of gold, Django (Hill) and his men are attacked by a group of bandits, and during the melee Django’s wife (Angela Minervini), who was accompanying him on the journey, is shot and killed. As he crawls to safety, a wounded Django notices that the leader of the bandits is Lucas (George Eastman), the right-hand man of newly-elected senator David Barry (Horst Frank), a good friend of Django’s who, a day earlier, invited him to join his organization. Five years later, Lucas and Barry are still stealing gold from passing wagons, each time pinning the crime on an innocent man who, before he knows what’s hit him, is sentenced to hang. What the two thieves don’t realize, though, is that Django himself is the local hangman! By attaching a harness to the back of each condemned prisoner, Django manages to save their lives (while, at the same time, convincing all onlookers that the accused is dead). It’s Django’s hope that those he’s rescued from the gallows, including Garcia (José Torrès) and Johnathan Abbott (Guido Lollobrigida) will help him take his revenge on Lucas and Barry. But as Django will soon discover, not even saving a man’s life is enough to guarantee his loyalty. 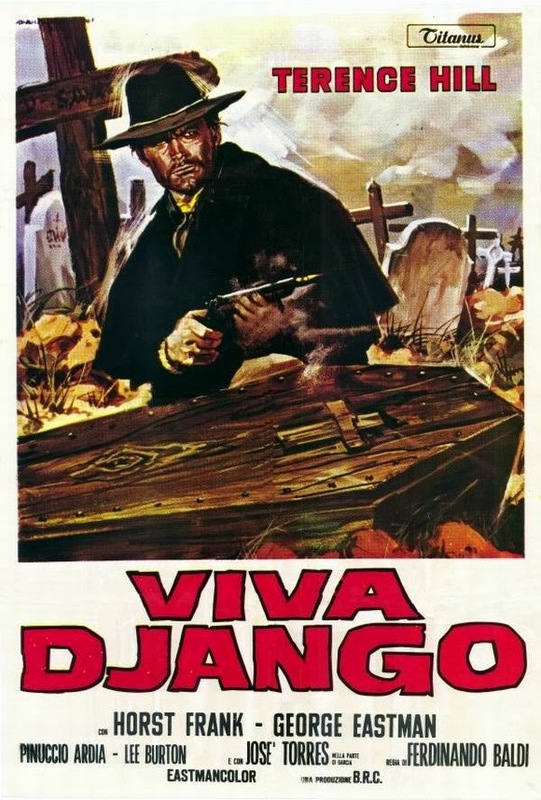 As with 1966’s Django, Django, Prepare a Coffin boasts a handful of great scenes, chief among them the saloon stand-off where Django battles it out with Lucas; and the finale, which (like a similar sequence in Corbucci’s film) takes place in a cemetery. In addition, Django, Prepare a Coffin has quite a bit in common with the original; aside from the lead’s outfit (it is identical in both movies), this 1068 prequel features the murder of Django’s wife, which is alluded to in Django (though the man responsible for her death is different this time around). As for Django, Prepare a Coffin's title song, “You’d Better Smile”, performed by Nicola De Bari, is not as strong as Rocky Roberts’ main theme for Django, but it is kinda catchy. And then there’s Terence Hill, who, along with his striking resemblance to Franco Nero, does a fine job stepping into the iconic role. He may not bring the same intensity to the part that Nero did, but Hill’s Django is nonetheless a far cry from the comedic characters he would play later in his career. Eve if it isn't the classic that Django is, fans of the original will more than likely get a kick out of this movie as well.